Join us once again for a 5K Fun Run or walk across Hessle's most iconic landmark and support Canine Partners. A huge thank you to all of those who took part in this event. Just Giving/Virgin Giving pages – you don’t need to do anything, the money automatically gets transferred to Canine Partners. Via our website – https://caninepartners.org.uk/donate/ and choose the first option, then select ‘Sponsorship’ from the drop down menu. 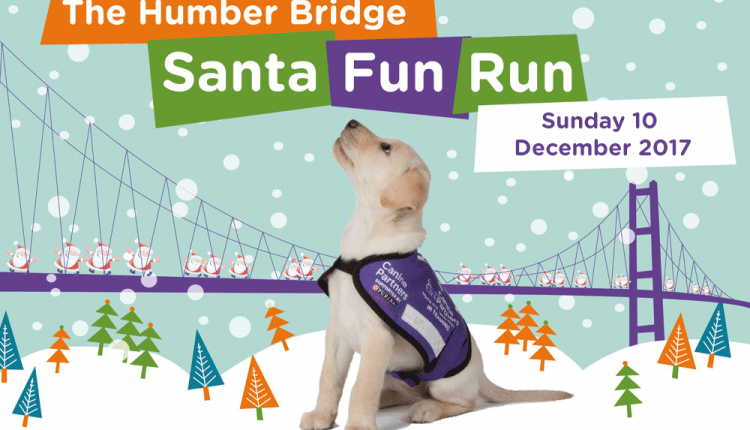 Please put ‘Humber Bridge Santa Fun Run’ after your name in the ‘first name’ box. On Sunday 10 December we will once again be holding a 5K fun run (or walk!) across the Humber Bridge in Hessle, East Yorkshire to raise much needed funds so that we can continue training amazing dogs to transform lives. You supply the trainers, we’ll supply the Santa suit! Location: Humber Bridge, Hessle (nr Hull), East Yorkshire (Humber Bridge Car Park) – The race will start from the Information Centre end of the bridge at the main Humber Bridge car park. Once you have booked your place, please be sure to email charlottej@caninepartners.org.uk with an emergency contact number for on the day, as well as any medical conditions or accessibility needs. On the day entrants will need to provide this information upon registration.